Magnolias are a large group (over 200 varieties) of spring flowering shrubs and trees that are native to east Asia, the West Indies and North America. There are both deciduous and evergreen varieties, most of which bear large, goblet shaped, fragrant flowers in early spring. The largest and most impressive magnolia is the evergreen Magnolia grandiflora. Although exotic in nature, magnolias are not difficult to grow. Many varieties dislike chalky soils, so check details before purchase if you have a very alkaline soil. Choose a site that is situated in full sun most of the day but sheltered from cold winds. 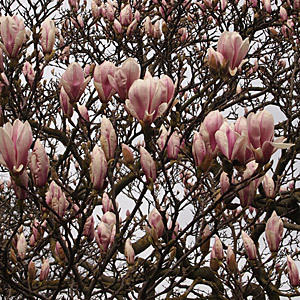 The buds can be susceptible to late frost damage so do not grow a magnolia in a an area that is exposed to a prevailing north-easterly wind. Any reasonable garden soil will do (sandy, clay or loam), which has been well dug over and a good helping of well-rotted compost added. Water in well if the weather is dry after planting. Pruning is not normally required but can be done midsummer after flowering. Do not prune back hard. Propagate by layering, or taking semi-ripe cuttings in summer. What is the most Popular Magnolia Grown in England? Magnolia × soulangeana (or saucer magnolia) is the most popular variety grown in the UK. M × soulangeana is a deciduous bush type, shrubby magnolia, which can reach a height and spread of around 15 to 25ft.